In between working full time and blogging, I sometimes run out of time to feed myself properly says the recipe creator! It’s my reality and I try to the best of my abilities to create quick and delightful recipes for those moments. My best tip when I’m out of time is to always have a fridge full of fresh veggies. 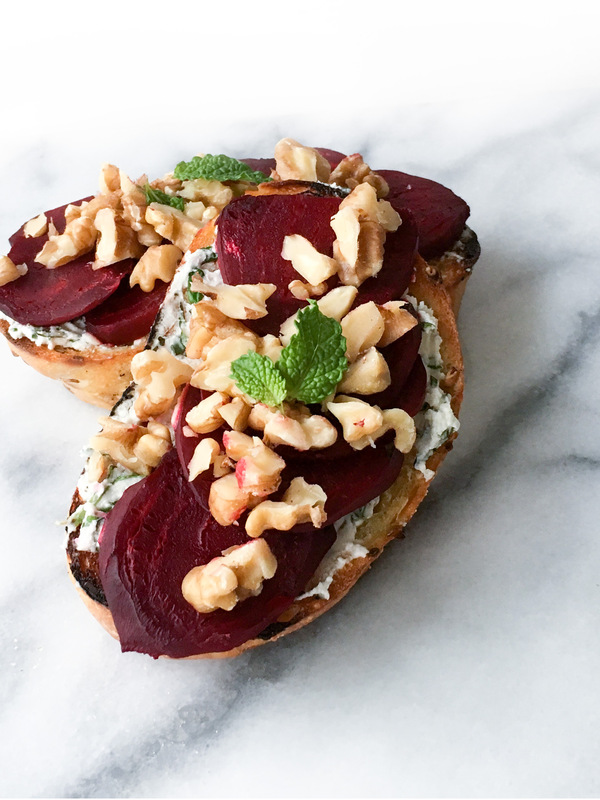 So here is my recipe of beet, fine herb goat cheese and pecan crostini. You can enjoy it as a starter as well as a full meal with a salad on the side. Brush slices on both sides with the olive. In a pan over medium heat grill both sides of the slices. In the meantime, in a bowl, add all the ingredients for the beet and cover. Microwave for 5 to 7 minutes or until the beets are cooked and tender. In another bowl, stir in all the ingredients “FOR THE GOAT CHEESE” mix until well combined. Thinly slice the cooked beets. When the crostini are nicely grilled, spread evenly the goat cheese, add a couple sliced beets and top with chopped pecans.